And help you choose the right Captain. Hello, Welcome to Game On Charters Elite Sportfishing Team Florida Fishing Guides Page. My name is James Fedor I will be your fishing guide and will show you the differences in Jupiter Fishing Guides and Why you should choose Game On Charters as your Charter Service. Our focus is to make sure you Catch Fish and Have a Fun, Safe and Stress Free Day on the Water. With 4 boats to choose from, We are sure to have a boat to fit any Budget or Fishing Style. First and foremost Game On Charters is "Home Of The No Fish No More Money Needed". Option 1 only on the Rates/Deposits Page, Bottom Fishing is a GREAT Charter Choice. We have total confidence you will catch fish bottom fishing. In fact, while bottom fishing, If no one catches a fish in your fishing party, You will owe "No More Money" at the end of your trip. Your Deposit is all it will cost you. We all know fishing has no Guarantee But, "This Is My Guarantee To YOU. I have taken the time to build this site myself, All the words, All pictures come from my personal experiences and photo library. I take great pride in doing things myself. This is why I bought the Solo Build It Kit and decided to develop my own website. If your intrested in Owning your own Website Check out this Program! It is a Winner. I hope you enjoy this site and take the time to refer it to friends and family thinking about traveling to South Florida, Specifically Jupiter, Florida that are interested in going on a Florida Deep Sea Fishing Charter. I have had my US Coast Guard license for over 23 years. I started as a first mate at the age of 12. First mating for me was such a joy I grew up in Port Clinton, Ohio which is the Western basin of Lake Erie. Fishing every day with six new guys listening to their stories enjoying the day with them telling jokes, Eating great food and enjoying time on the water was what I lived for. At age 24 I went and took my test for the US Coast Guard license and passed. For many years I ran other people's boats. I finally was able to purchase my own boat which was 27-ft SportCraft. Now I have a Fleet of Boat to offer you. The 32' Mirage is my most current boat and she is a dream to fish! Check out option 1 on my Rates/Deposit Page. My Business Name is Game On Charters and the Game is ON! As you see from my Florida Deep Sea Fishing Charter Photos Page I have been very successful! Working as a Florida Fishing Guide! Florida Deep Sea Fishing off of Palm Beach County is the best! We are located in Jupiter, Florida. 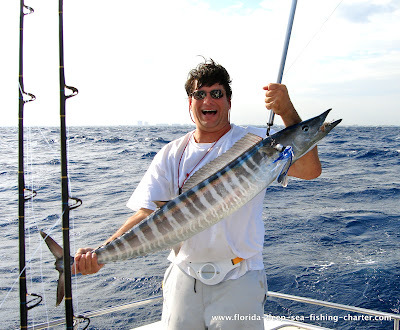 Whether you book a trip for Bottom Fishing or Sportfishing you're sure to have a lot of FUN! So take your time visit the Bottom Fishing page, Trolling pages decide what fishing experience best fits you and your fishing party. Choose Game On Charters Elite Sportfishing Team Home of the Best Florida Fishing Guides! With 4 boats to choose from we are sure to have what you are looking for. Remember!, If you have any questions please E-Mail Me Your Questions If you prefer to call me don't hesitate I'm always available. 561-891-0033 "Find Me Anytime"
See How Reasonable my Rates are!